I’ve been studying the Bible in earnest for just over 15 years now. All that time, I’ve never been completely satisfied with my research tools. Some have been good, some not good, but nothing has ever done the job as well as I would like. 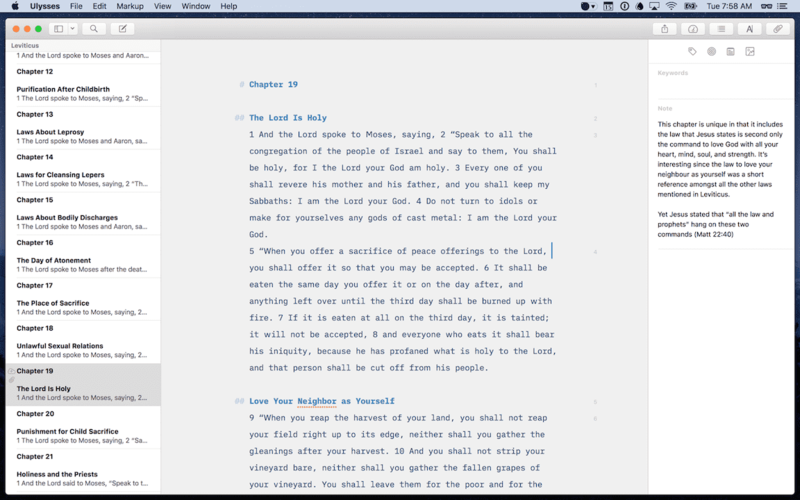 For the past 10 months, I’ve been using Ulysses as my primary tool for tracking my thoughts and questions during times of studying the Bible. I’d like to share how I’m using it as it would also likely work well for other similar purposes. Whether you’re researching to complete your thesis or you’re completing research for your novel, I believe the same principles can apply. If you have a large amount of text (like, really large) that you need to review regularly and markup with your thoughts, questions, and notes, I think Ulysses would serve you well. Before I share how I’m using Ulysses in this way, let me start with what I’m looking for in this type of tool. As I first started to read the Bible with intention, I would mark up the pages. I would highlight or underline passages that resonated with me. If something didn’t make sense, I might make a note in the margins. Over time, I could find my way through the book because of the familiarity with this marginalia. But I soon wanted to capture this content in a digital format. Why? Because my first paper Bible was not well made and only lasted for 5–6 years of serious study. As I moved to my next paper Bible, I mourned the loss of all my efforts in the first one. I considered going through the work of manually migrating my notes and highlights to the new copy, but realized this would have to be repeated several times in my life. A digital copy of my studies would be a better option. By this time, I had also gotten to know the content of the Bible a lot better. Once you start to recognize repeated themes, there is a desire to somehow connect them together for future references. Tagging has failed to stick for me when organizing files, photos, and other digital memorabilia, but this situation is the perfect use case for tagging and works well with digital tools. YouVersion is the top choice for the best Bible apps for iOS. I’ve enjoyed it as well for the social aspects, but when it comes to more rigorous study, it lacks. Logos is the big player in this space, and while I know many pastors who use it, its pricing is so outrageous it was never an option I gave serious consideration. So, I’ve spent the last five-plus years pouring my notes and highlights into the Bible Study app from Olive Tree. It was solid enough that I used it all this time, but the experience was poor enough that I was always hoping for something better. It took a conversation with a fellow who saved his study notes in a Git repo to get me thinking about this problem differently. When I approached this problem with a different mindset, I realized I did not need to store my notes and thoughts in the same place I do my Bible reading. I tried to think of tools that could contain all my content and make it easily reviewable, across all my devices, but didn’t require multiple translations and a pleasurable reading experience. This led to a lot more options. I considered Day One, a combination of Git repos and Sublime Text, and Ulysses. My primary goal in this area is to have a reviewable resource of all I have questioned, studied, and learned over my years of studying the Bible. It should also allow me to review those notes and thoughts across themes and topics. So if there are passages in Genesis, Job, and John that all relate to eschatology, I should be able to see that easily. Bible Study from Olive Tree came close to meeting all my needs. It wasn’t the most pleasing reading experience (NeuBible wins that award), but it was adequate. It provided all the translations I wanted, but while it allowed me to highlight text, store notes, and add tags to both, working with any of those items could be maddening. I realized Ulysses could give me all I wanted in a far more usable fashion. Structure: Ulysses, of course, does not come populated with Scripture. So you have to find a way to get it in there. 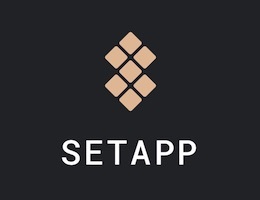 Copy and pasting from your current Bible app works, but so too does using services that provide an API (the ESV is my favorite translation and lets you grab 500 verses per query). However you get it in, Ulysses provides a suitable structure with groups and sheets. 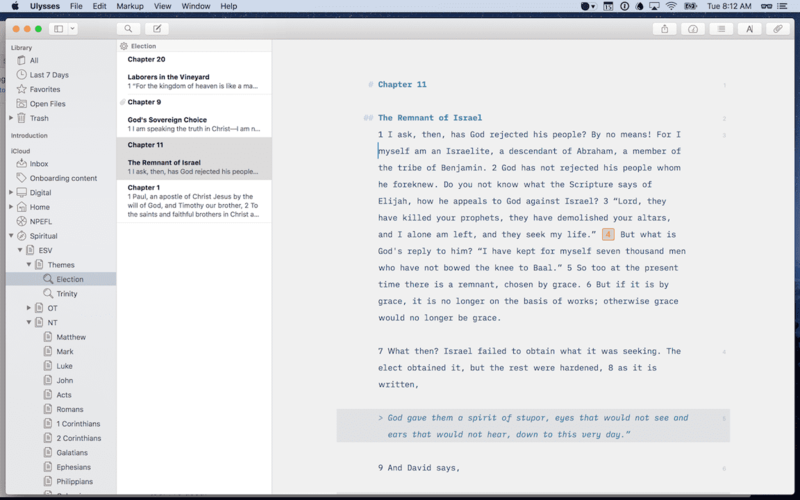 I have the ESV broken into groups for each book, and each chapter of a book has its own sheet. When it comes to the classic conundrum of storing digital information in folders or tags, Ulysses lets you do both. So I use the folder model with groups and sheets to replicate the structure of Scripture. Storage: One question I had was whether Ulysses could handle this kind of volume. But if authors of multiple books could use it, I assumed it would work. The Bible has around 800,000+ words, give or take several thousand depending on your translation. My entire Ulysses library currently has around 550,000 and the only issue I have run into is how the contents are, at times, off loaded on my small iPhone (28 GB). But on the desktop or the phone, the amount of text I have saved never causes slowness or any other issue. So I’m guessing it can handle a lot more. Highlights: Another aspect I wanted to see here was highlights. I have many, many passages marked from my years of Bible study and I want to include them in my research. Thankfully, Ulysses’s support for Markdown allows bold and italic text to meet this need. I’ll use blockquotes as well (mostly for instances where a New Testament author is quoting the Old Testament). Notes: This is the most vital criteria for my system. My primary reason for not being wholly satisfied with Bible Study is that working with your notes and tags is a frustrating experience. The different ways of interacting with notes you’ve created are confusing and unintuitive. My solution had to provide a great experience for both creating, reviewing, and searching for notes. This is the pillar of my digital Bible study resource. Thankfully, Ulysses gives you several options. First, you can add notes to a sheet in the Attachments side panel. As I use sheets for an entire chapter of one book of the Bible, these types of notes would be more of a summary than a specific thought. Second, Ulysses provides options for adding different types of content inline. 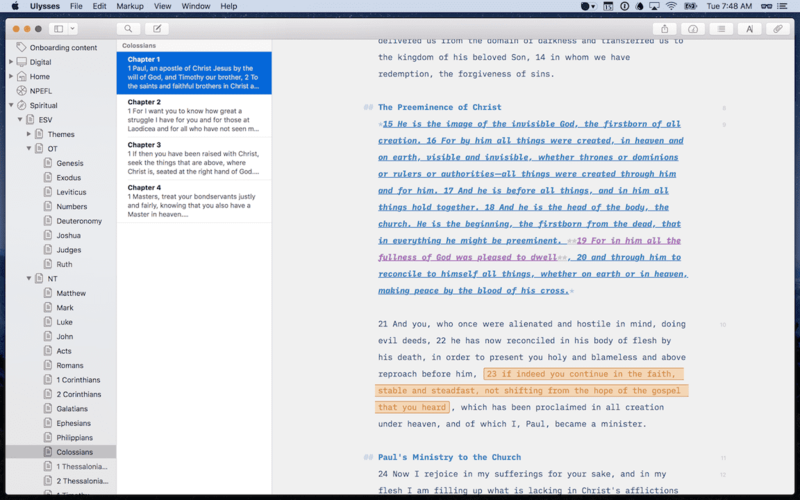 The one I’ve chosen to use primarily is annotations, but you could also choose to use footnotes or comments as well. Why annotations? Comments are inline, but stay visible at all times. Since I want to view the Biblical text on its own most times, I prefer to use a footnote or annotation since comments would interrupt the flow of the text. 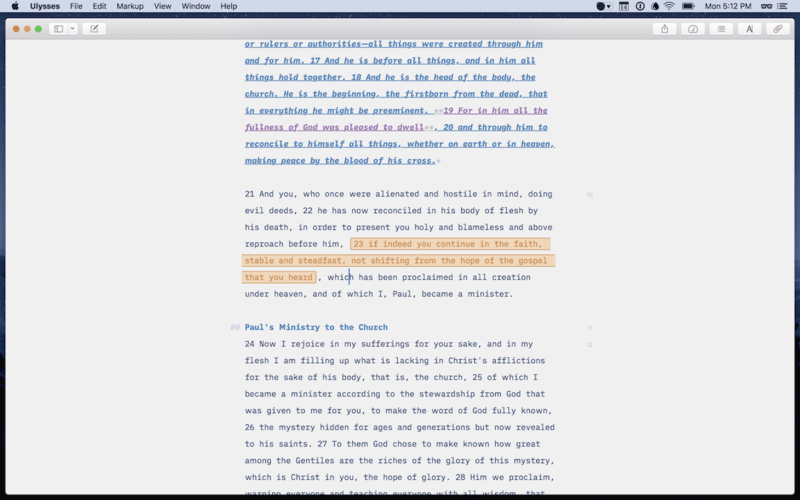 Both annotations and footnotes allow you to add commentary that is only visible when you click on the element itself. Otherwise, it is hidden from view apart from some nice formatting of the original text. And the last distinction is that annotations allow you to select a portion of text, then add your thoughts in the hidden modal. In comparison, a footnote is intended to be added next to a portion of text and includes “FN” at all times. Both are good options, but I like the annotation as it does not add the two extra characters to the text itself. Whatever your preference, Ulysses has an option that will likely suit. It allows you to nicely mark up a long form of text in a way that is aesthetically pleasing and easy to use. Tags: The last thing I need in my set up is a way to tag verses of my notes with common themes. If you’ve ever had the pleasure of scanning the contents of a book of systematic theology, you know there are a lot of themes when it comes to this discipline. The Bible is a large book, but is amazing for the consistency of its narrative from start to finish. Themes found in Genesis are repeated many times before getting to Revelations. As such, I want to be able to create a note and have it include one or more themes. I can then find this specific note if I were to search for that theme. And in this area, Ulysses shines again. It comes with two main options. First, the most obvious option is found again in the Attachments sidebar. There is a keywords modal that allows you to apply keywords to an entire sheet. In Ulysses 13, these keywords are even color-coded, making them that much easier to differentiate themes in the sheets sidebar. This is useful at times, but I don’t use it all that much because a typical chapter in the Bible will touch on multiple themes. When searching, I want to zoom into the exact text, not an entire chapter. Searchable: Related to these tags, finding your content needs to be easy and intuitive. Otherwise, you’ll stop creating notes if you consistently struggle to find them. 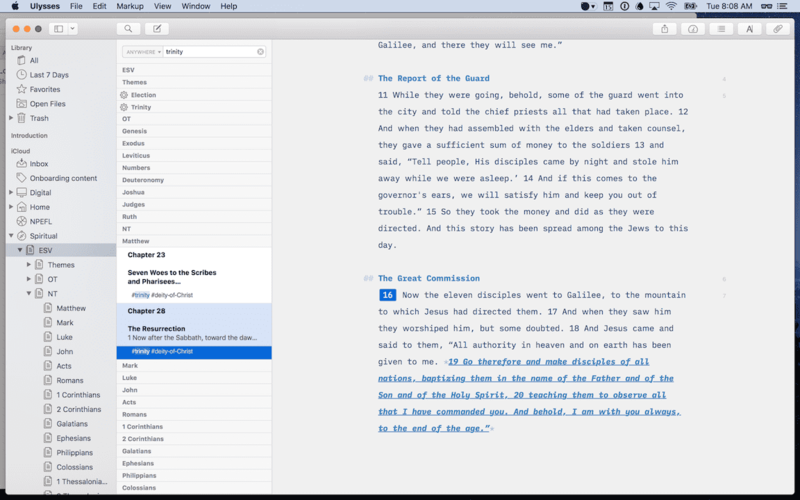 In my experience, most of the major Bible apps do an adequate job of this, but Ulysses does better. First, you can select a scope for your search by selecting a group. This means if I know I only want to look for something in the Psalms, a Gospel, or the entire New Testament, I can select the necessary groups, then use the Search in Group menu option (also available via a toolbar icon or typing Shift+CMD+F) and enter my search text. Second, you can narrow your search down to types of content. This is an amazing small touch that adds delight to using a great piece of software. I can narrow my search to annotations only, and this will immediately show only the sheets that include a note I’ve created. And, of course, I can enter some text to narrow down further. If you have multiple notes across multiple sheets in your search, you can click on the highlighted text in the Sheets column to find the exact text location in a sheet (highlighted in blue). This is handy when your note contains the same words that are also somewhere in the sheet itself. Back to my use of the hashtag — this allows me to search for keywords only and not have actual Scripture passages included in my search results (if I search for “election”, the results will include both notes and Bible verses that have this word. But if I search for #election, I get only my notes). Last, you can also save these searches using Filters. If you find yourself searching for a specific theme regularly, Ulysses allows you to add a Filter in the same manner as adding a Group or Sheet. I save these under their own group. 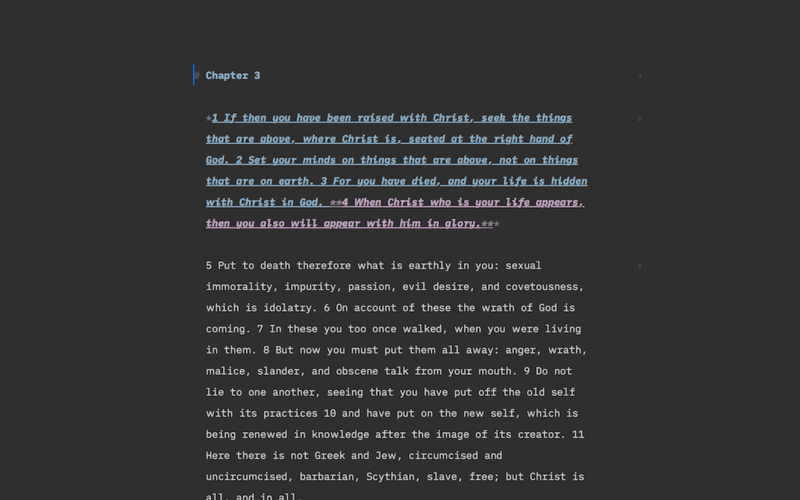 All this to say, finding stuff in Ulysses is a delightful experience and is far better than any other tool I’ve used. So how do I use this resource day-to-day? Well, first, I don’t use it daily. I still do my reading in other places. My lovely illustrated ESV is where I spend most of my time, but if I’m reading a digital copy of the Bible, it’s in NeuBible. When a thought strikes or I have a question I don’t know the answer to, this is where Ulysses comes in. When I’m preparing to lead a Sunday school class, this is when I use it the most. My daily devotional reading still takes place in other tools, but serious study and long-term documentation happen in Ulysses. Am I concerned that my notes are not always sitting alongside the text I’m reading? Just the contrary: I prefer the focused reading experience. When needed, I have my phone nearby, and I add the note during my reading or study time. With 15 years of notes already created, I’m more often referring to existing items or searching on a theme than making new notes. Aside: it also takes a lot of time to manually copy and paste the entire Bible over along with 15 years of notes. I’m still in that process. If I need to make a note about a passage that is not yet in Ulysses, I copy over that entire chapter as I go. No tool is perfect. But this has been the best setup I’ve experienced for this specific need. Now, we realize not everyone is into studying this old book. However, it would also likely work well (and in a similar fashion) for anyone conducting research of various types. 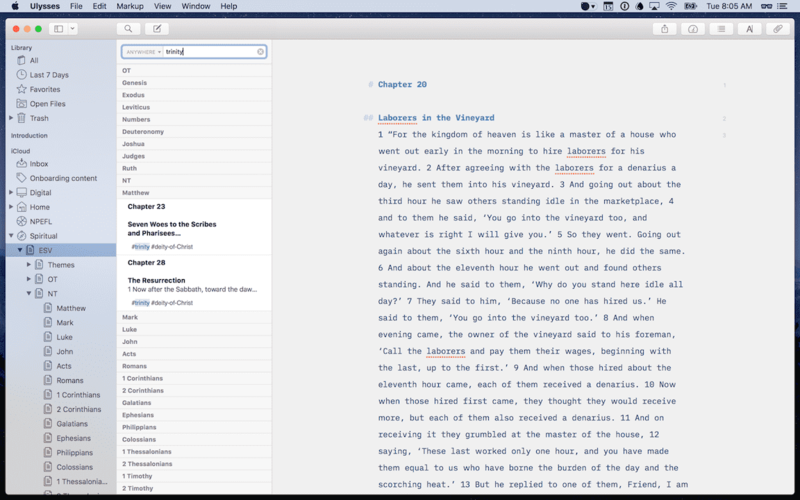 If you don’t use Ulysses, we highly recommend it (as if you couldn’t tell already). 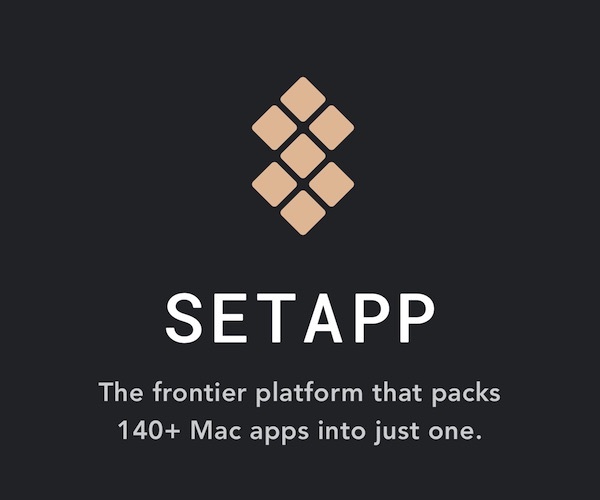 But even if you have, I hope the details here will help you get a little more from one the best apps available for macOS.